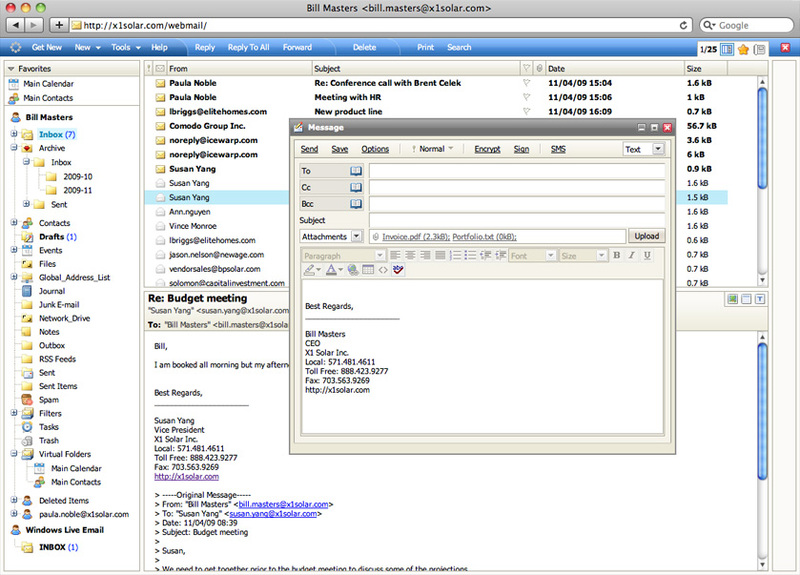 IceWarp Email Server is at the core of IceWarp Unified Communications Server. Time-tested and robust, it provides unsurpassed power and unparalleled flexibility. For over a decade, companies that demand stability, security, speed, power and ease-of-use have deployed IceWarp Email Server on over 50,000 servers around the globe, supporting 50 million users. IceWarp Email Server supports SMTP, POP & IMAP standards and works with all known email clients and servers on the market. By default, all services utilize SSL/TLS encryption, supporting deployments of every kind, from small business single-server installations to multi-server load-balanced platforms that serve tens of thousands of users. Single Sign-On (SSO) and multi-protocol GSSAPI capability mean the users are never prompted for password in Kerberos enabled environments. Automatic IMAP integration makes certain that you remain compliant with the Sarbanes-Oxley Act (SARBOX) by archiving all incoming & outgoing email messages in isolated non-production storage. 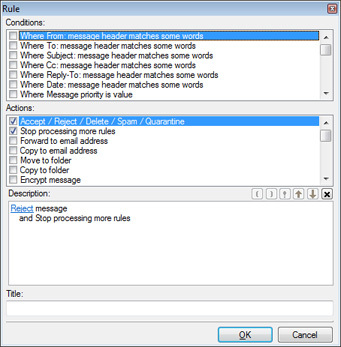 Messages are saved as files in a tree folder structure, making restoration a simple matter of dragging the appropriate files back to each user's IMAP folder. Users can access the archive via any email client – but cannot change stored data. IceWarp SmartAttach ™ is new technology that comes with a number of benefits. 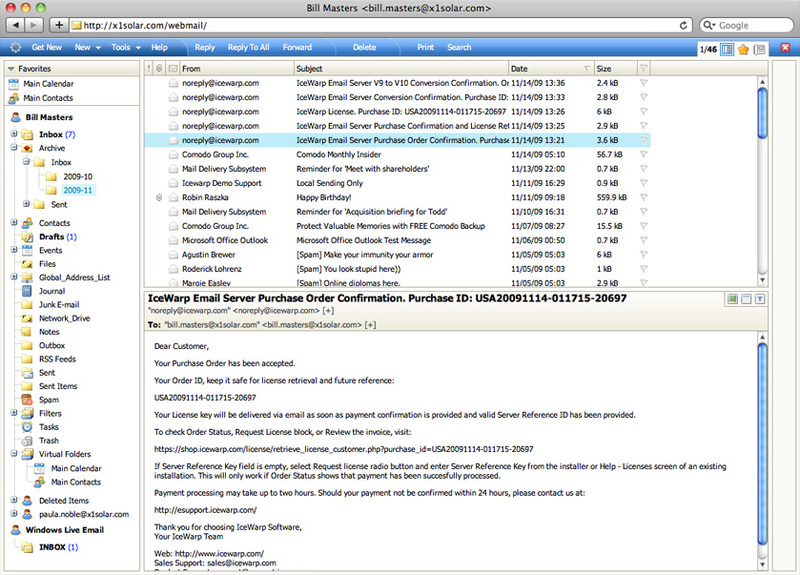 Attachments are not actually affixed to the email itself; rather, they are made accessible via unique and secure hyperlinks that are embedded in the email. Senders of SmartAttachments are able to delete email attachments even after they've sent the message – giving your company far greater security. Plus, SmartAttach is very resource-aware because it gives recipients the freedom to access attachments at a time of their choosing. Both the Windows and Linux versions of IceWarp Server can be securely managed via a Windows-based administration console, the web-based administration interface, the command line interface, and IceWarp's Remote Administration Console for Windows. 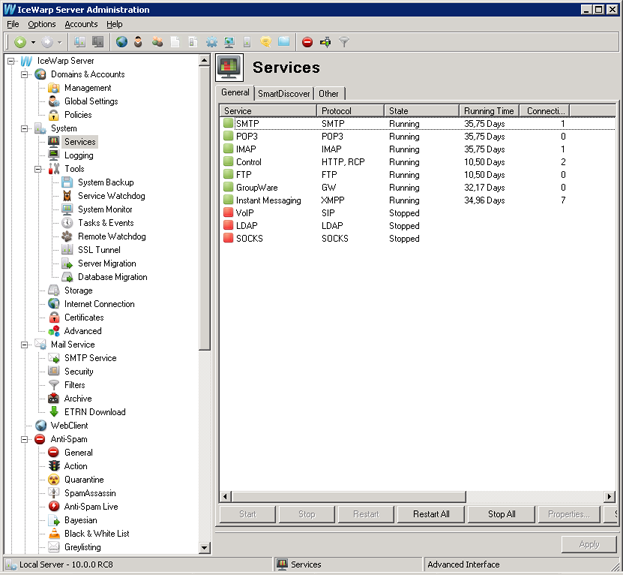 The Directory Service option lets IceWarp Server regularly synchronize with an Active Directory Service. 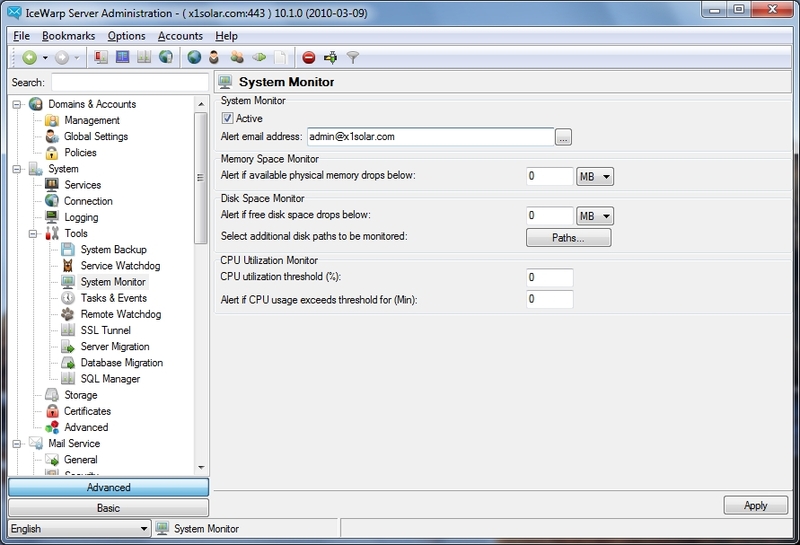 Any changes to users within the AD server will be automatically reflected in IceWarp Server. 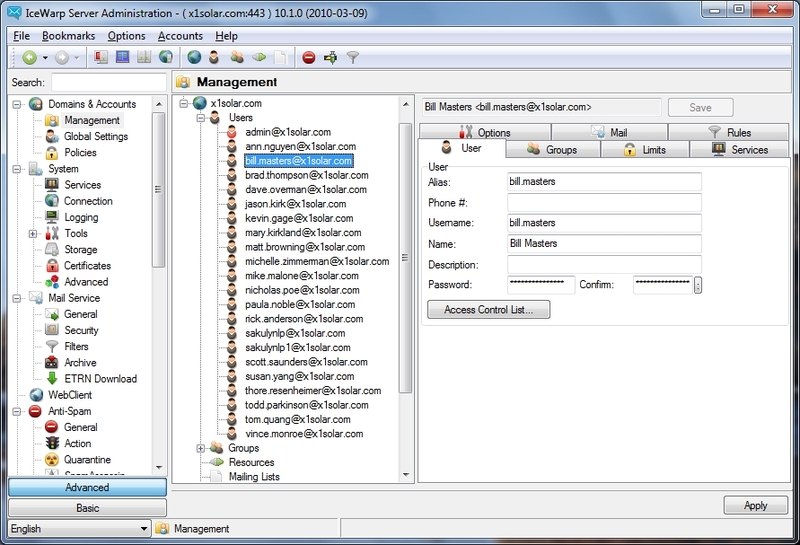 Powerful server-side filters and rules can be applied to all users, specific users, groups or domains on the server. Server-side rules can enforce business processes, move messages from folder to folder, make copies, run applications, extract attachments to folders, add and modify headers and footers, and more. With sophisticated integrated tools, IceWarp can monitor its own system performance and uptime, both locally and remotely. IceWarp can also send administrators regular system health reports via any mode of communication, including email, text message, and IM. 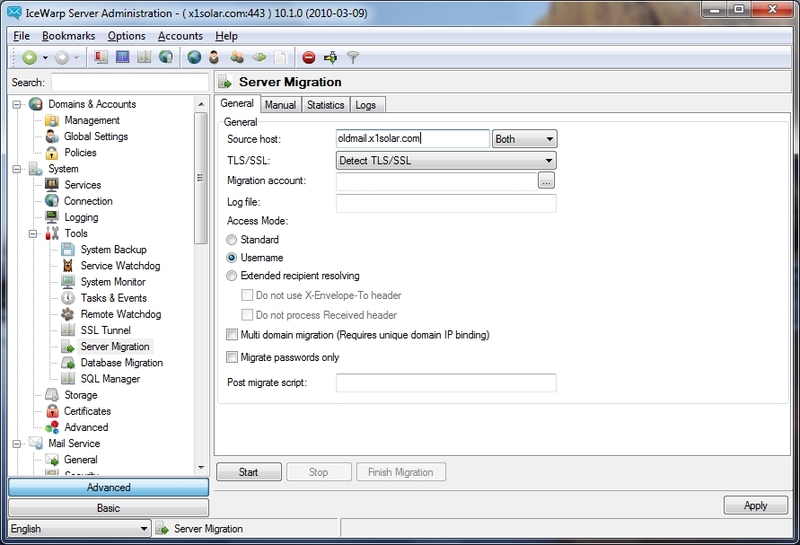 IceWarp Server's fully-integrated migration tool provides manual, semi-automated and fully-automated POP3 or IMAP migration from any platform – even if login credentials cannot be obtained. By capturing user credentials via IceWarp's Smar­tProxy technology, administrators can automatically migrate accounts to IceWarp Server.